With the new Azurriland site now being up and running off of the Xenforo forum software, there's a LOT of new features that we've never had access to. Most being aesthetic or functional features, however there are also some more security options such as 2FA. Note to mods: If this isn't the correct section, please move it. Couldn't see a more relevant place to put this. 2FA, or 2 factor authentication, is a feature that grants greater security on your account by asking for a code when you login. The code is generated one of two ways; either via an authentication app (eg, Google Authenticator, LastPass, etc) or a generated code sent to your email address. Ok...and why should I use 2FA? 2FA, as you may have guessed, gives you greater security on your account against people trying to gain access to your account through the use of programs that attempt to guess you password (aka brute force attacks") or stopping people from accessing your account who may know your password through other means. Hmm...well, how do I actually use 2FA then? Here's a guide on how to setup 2FA with Google Authenticator. You don't have to use this app on your phone, you can use any you like. The steps will more or less be the same. 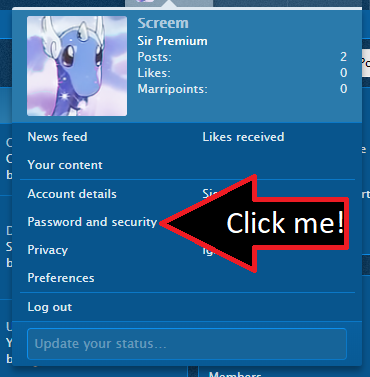 Click on your account name (top right corner) and click "Password and Security" in the account window that pops up. Look for where it says "Two-step verification" and, if it says"Disabled", click "Change". If it says "Enabled" you have already setup 2FA on your account. Click "Enable" next to "Verification code via app". I STRONGLY suggest you don't use "Email confirmation" as this is/can be a very insecure method. You will now have 2 options. One to scan a QR code on your phone (personally this didn't work for me) and the other to manually input a code into Google Authenticator (this is the option I had to go with and will be showing you). On you phone, open "Google Authenticator" and tap the "+" button in the bottom right corner, and tap on "Enter a provided key". 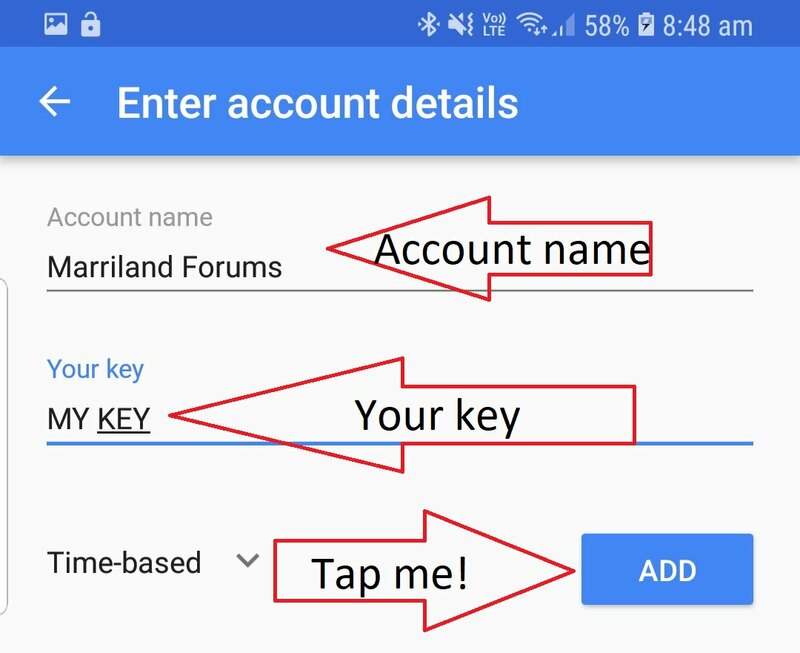 Add an "Account name" that you won't forget or won't confuse you then enter the key from your Marriland account page (step 4) into "Your key" and tap "ADD". The new account authentication will now show up at the bottom of your accounts in "Google Authenticator". Back on the 2FA screen on Marriland, type in the 6 digit code from "Google Authenticator" into the "Verification code" and click "Confirm". Congrats! You just successfully secured your account more. I've got a few suggestions for you to do with account security. You can do these, but you don't have to. I'm not your mum. DO NOT use the email verification option for 2FA. If someone has access to your email account, they can easily bypass this 2FA measure. DO NOT use the same password across multiple accounts. You can use password managers to keep track of your accounts, such as LastPass. DO NOT give anyone access to your account or email account. This can be applied to any account you hold. DO NOT share your password or any identifying personal information about yourself. People can use these to their advantage. If you have any question or suggestions, feel free to PM me here or on Discord (Screem#1620).